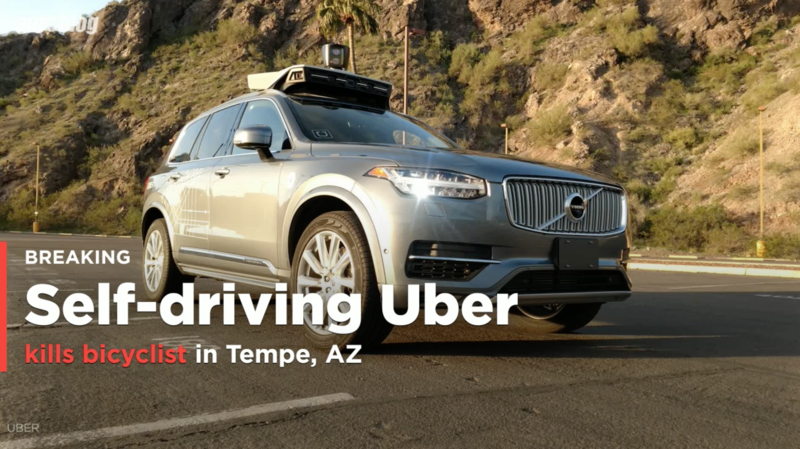 The police chief in Tempe, Ariz., has told the San Francisco Chronicle that a preliminary look at video of the fatal crash involving a self-driving Uber car in Tempe indicates "that the Uber would likely not be at fault in this accident." Elaine Herzberg, 49, was pushing a bicycle laden with shopping bags around 10 p.m. Sunday when she suddenly walked from a center median into a lane of traffic and was struck by the Uber-equipped Volvo XC90. There was a human behind the wheel of the car, but it was traveling in autonomous mode. The Uber was going 38 mph in a 35 zone and made no attempt to brake. "The driver said it was like a flash, the person walked out in front of them," said Police Chief Sylvia Moir. The driver's "first alert to the collision was the sound of the collision." Herzberg was unconscious at the scene when medics arrived and later died at a hospital. Hers is the first pedestrian death involving an autonomous vehicle. Police have reviewed video taken from a forward-facing camera on the Volvo and one showing the inside of the car. "It's very clear it would have been difficult to avoid this collision in any kind of mode based on how she came from the shadows right into the roadway," Moir said. Police have not made the videos public. The area where Herzberg attempted to cross Mill Avenue was dark, about 100 yards from a well-lit crosswalk but in a location where a walkway intersects with the street. "It is dangerous to cross roadways in the evening hour when well-illuminated, managed crosswalks are available," Moir said. Of course, jaywalking is a common driving situation requiring caution by human drivers and autonomous systems alike. Tempe police, the National Transportation Safety Board and the National Highway Traffic Safety Administration are investigating. Hundreds of autonomous cars are operating in Arizona, one of the hotbeds for testing the technology. Uber uses the cars to shuttle passengers in parts of Tempe and Scottsdale. Moir was aware of only one other accident, when an Uber in self-driving mode flipped onto its side a year ago. But the driver of the other car was cited for failing to yield. "I suspect preliminarily it appears that the Uber would likely not be at fault in this accident, either," Moir said of Sunday's accident. However, she stressed her comments were preliminary. "I won't rule out the potential to file charges against the (backup driver) in the Uber vehicle." As for whether the technology could be blamed, "This is really new ground we're venturing into," she said. As for that backup driver, the Arizona Republic newspaper reported that Rafaela Vasquez, 44, had served almost four years in an Arizona prison in the early 2000s on an attempted armed robbery conviction. An Uber representative declined to comment on her background and the company's hiring policies. But police said she had been convicted under a different name. Tempe police Sgt. Ronald Elcock said impairment did not initially appear to be a factor for either Vasquez or Herzberg. San Francisco-based Uber was fined $8.9 million in November 2017 by Colorado after the state determined the company had hired nearly 60 drivers with previous felony convictions. Colorado state law prevents felons, those with alcohol or drug-related driving offenses, sexual offenses or major traffic violations from working as drivers.